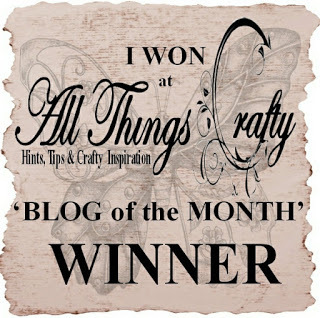 Hi and welcome to my blog if you are visiting for the first time, and welcome back if you are a return visitor. I’ve written previously about being asked to make Welsh Sympathy and Birthday Cards. 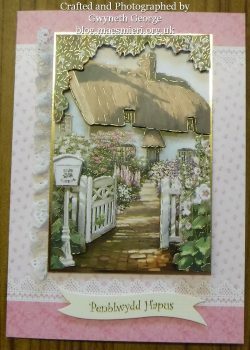 This first card was made using a Hunkydory Decolarge topper with around half the decopage layers. 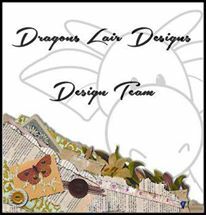 The base card was also made by scoring and folding in half one of the A4 background sheets in the same collection. As the cardstock has a lace printed decoration on it near the top and bottom I decided to add a piece of lace down one side of the topper. I used 2mm deep, double sided, foam tape to attach everything together and fingerlift tape to put a suitably worded insert inside. This is a closeup to try and show the dimension of the topper. This card was made using a pre-scored A5 white card base and a background and toppers from Kanban. Fingerlift tape was used to stick on the background and the insert, and 2mm deep, double sided, foam tape, was used to stick on dancers and keyboard. 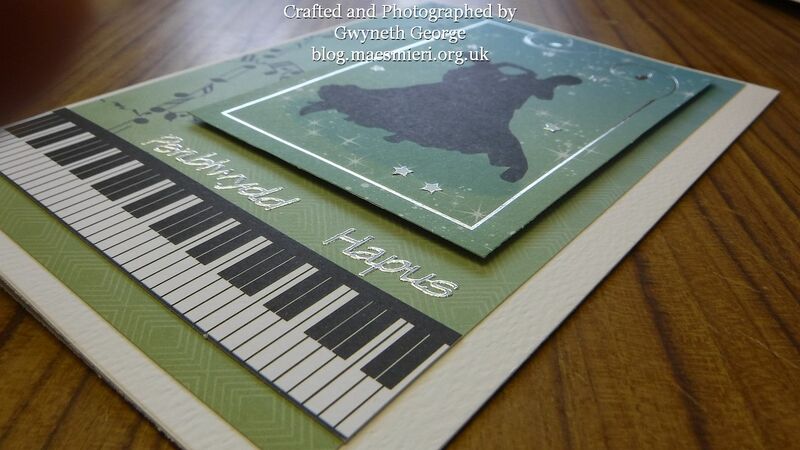 A simple Welsh Happy Birthday peeloff was added. And again a view to show that the topper is raised. 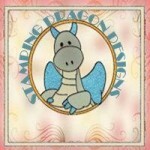 The base card is a pre-scored 8″ square white card. 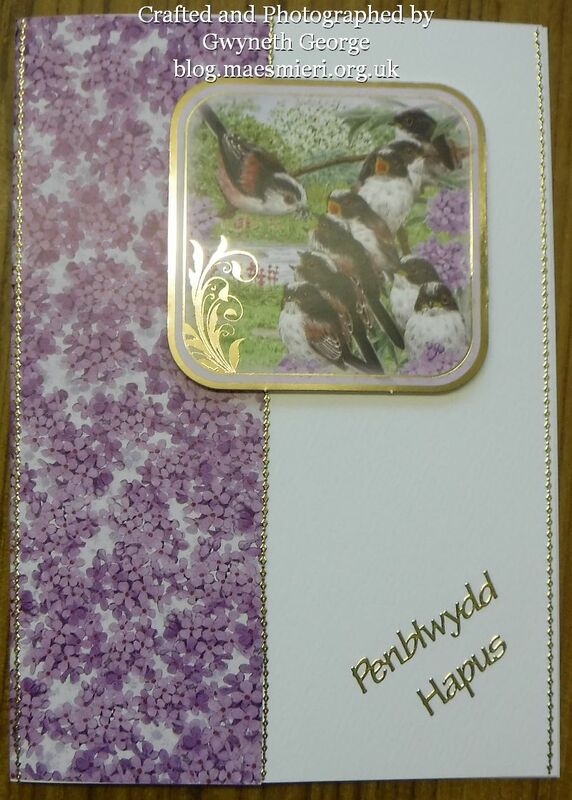 I think that the backing paper and topper came from a Craftwork Cards collection, but I’m not sure. If you know differently let me know. The backing paper and insert were attached using fingerlift tape, and the topper and greetings banner were attached using 2mm deep, double sided, foam tape. I finished off by putting two strips of Pinflair peeloffs around near the edge. I’m not sure where the backing paper came from, it was in my stash from somewhere. The card is a pre-scored A5 white card. 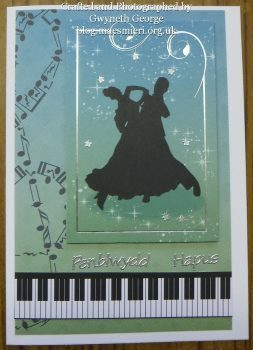 The bachground was stuck over half the card , Pinflair peeloffs were used to edge the card and panel. 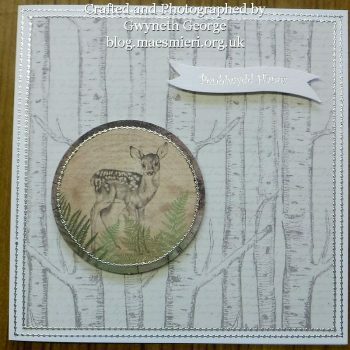 Then the topper, which I think is from a Hunkydory collection, was attached before finishing off with a Peeloff greeting and an insert. 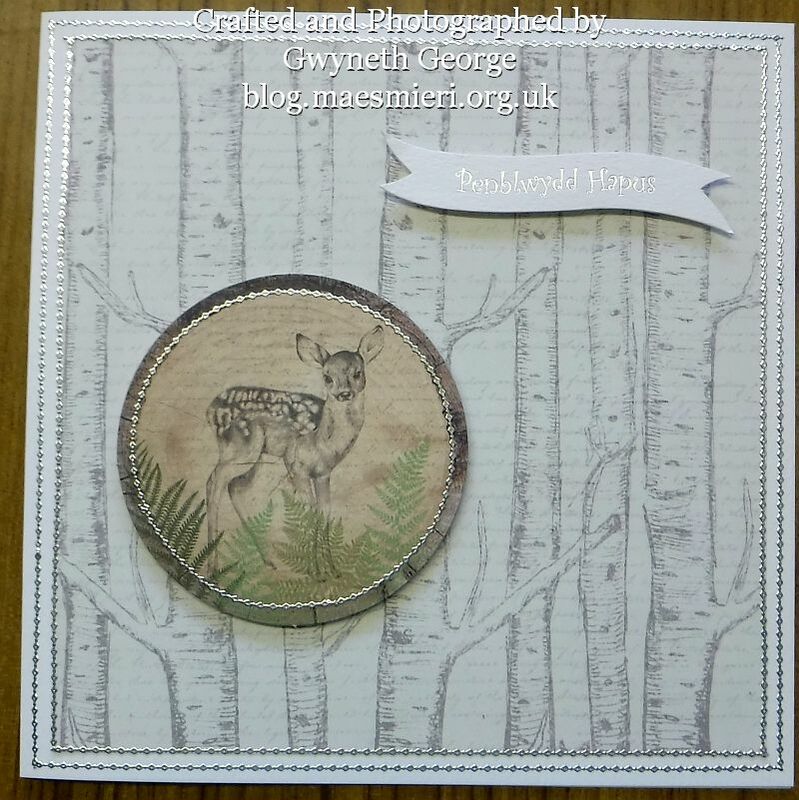 This 6″ square card is decorated using mirror card and a Pollyanna Pickering image. The same peeloff greeting was put on the front as well as the insert inside. 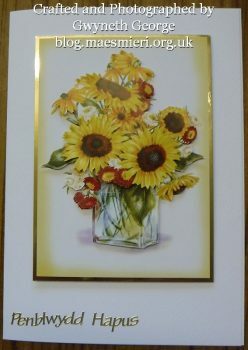 This next photo is of the same card showing the dimesion between layers. 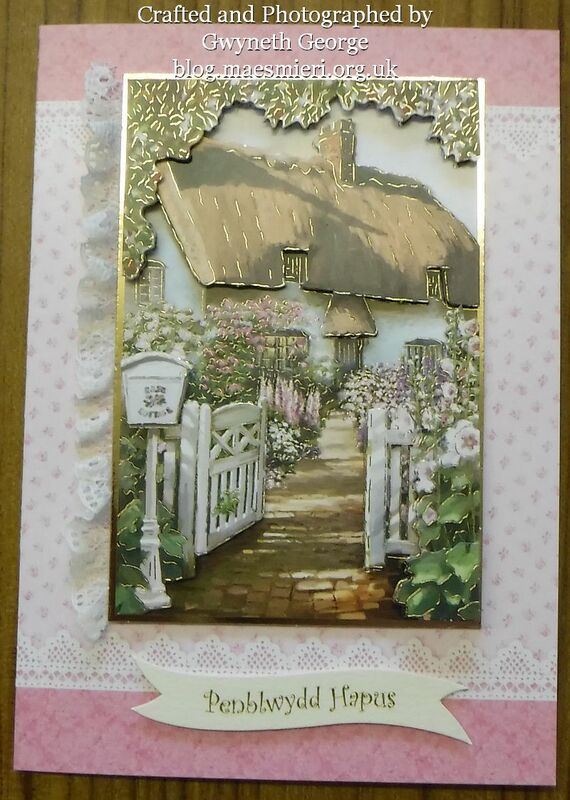 This A5 card is decorated using three copies of an image from one of the floral themed “Little Book Of …” from Hunkydory. One was stuck directly to a miri mat from Hunkydory, while the rest were cut into so that I had layers to decoupage. 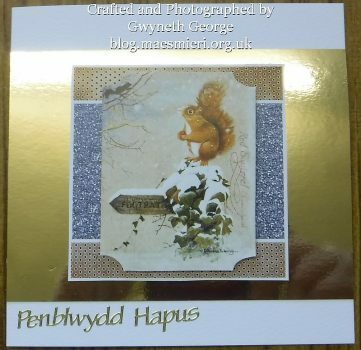 The matted image as well as the decoupage layers were added using 2mm deep, double sided, foam tape. The insert inside has the same greeing as the peeloff I put on the front. 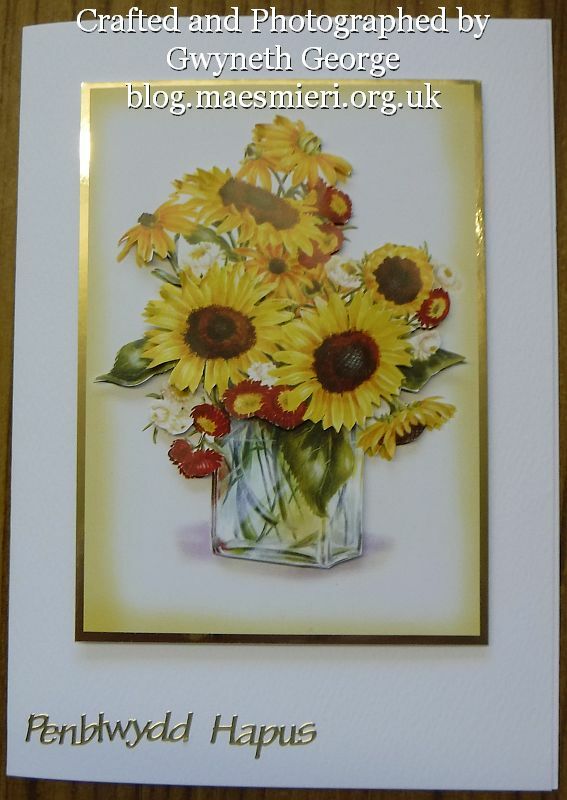 This next photo is of the same card trying to show the different layers created by cutting out some of the flowers from two extra sheets of the same image and sticking them on using 2mm deep, double sided, foam tape.